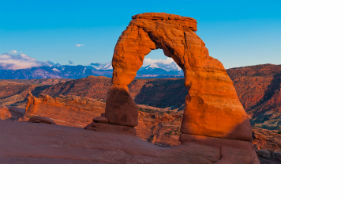 Start with letting us show you a list of Utah's National Parks and Monuments. Our goal is to make your visit more enjoyable by providing updated information. 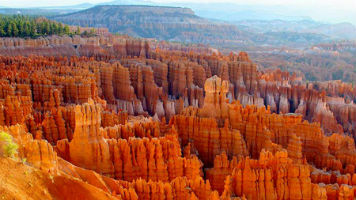 The sheer beauty of Utah's National Parks and Monuments are, "we'll let you decide!" You can camp at all the national parks in Utah, and each offers ranger-led activities. Geology is an important element in all of Utah's national parks, with impressive rock formations forming the bases of all them. Arches is located in Southern Utah, near the city of Moab. Arches National Park preserves over two thousand natural sandstone arches, including the world-famous Delicate Arch, in addition to a variety of unique geological resources and formations. In some areas, faulting has exposed millions of years of geologic history.The extraordinary features of the park, including balanced rocks, fins and pinnacles, are highlighted by a striking environment of contrasting colors, landforms and textures. 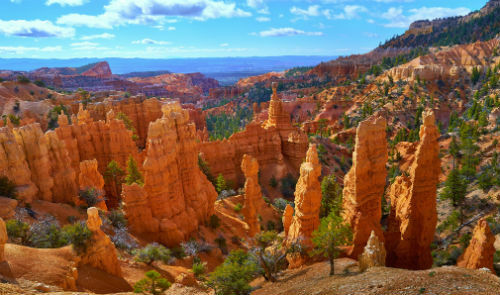 Bryce Canyon, famous for its worldly unique geology, consists of a series of horseshoe-shaped amphitheaters carved from the eastern edge of the Paunsaugunt Plateau in southern Utah. The erosional force of frost-wedging and the dissolving power of rainwater have shaped the colorful limestone rock of the Claron Formation into bizarre shapes including slot canyons, windows, fins, and spires called "hoodoos." 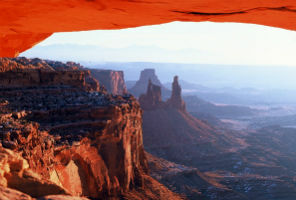 Located in the same corner of Utah as Arches, Canyonlands lies in terrain created by the Colorado and Green Rivers. This Utah national park is a haven for off-road recreation fans with several ATV trails. Visitors can also indulge in whitewater rafting, hiking and cycling. Canyonlands National Park preserves a colorful landscape of sedimentary sandstones eroded into countless canyons, mesas and buttes by the Colorado River and its tributaries. The Colorado and Green rivers divide the park into four districts: the Island in the Sky, the Needles, the Maze and the rivers themselves. While the districts share a primitive desert atmosphere, each retains its own character and offers different opportunities for exploration and learning. Canyonlands invites you to explore a wilderness of countless canyons and fantastically formed buttes carved by the Colorado River and its tributaries. Rivers divide the park into four districts: the Island in the Sky, the Needles, the Maze, and the rivers themselves. These areas share a primitive desert atmosphere, but each offers different opportunities for sightseeing and adventure. The Waterpocket Fold, a 100-mile long wrinkle in the earth's crust known as a monocline, extends from nearby Thousand Lakes Mountain to the Colorado River (now Lake Powell). 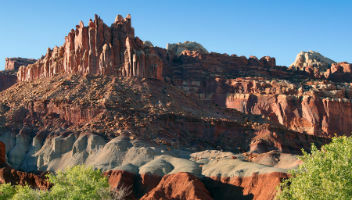 Capitol Reef National Park was established to protect this grand and colorful geologic feature, as well as the unique historical and cultural history found in the area. This is Echo Park, named by John Wesley Powell in 1869 during his first scientific expedition into the Colorado Plateau. It is here that the Yampa River, the last natural flowing river in the Colorado River System, joins the Green River. This is home and critical habitat for the endangered peregrine falcon, bald eagle, Colorado pikeminnow, and razorback sucker. Indian rock art in Echo Park testifies to the allure these canyons and rivers had for prehistoric people. In 1825, William H. Ashley and his fur trappers were the first Europeans to enter Echo Park. In 1883, Patrick Lynch, a hermit, was the first to homestead in this canyon. Lake Powell at Glen Canyon National Recreation Area (NRA) offers unparalleled opportunities for water-based & backcountry recreation. The recreation area stretches for hundreds of miles from Lees Ferry in Arizona to the Orange Cliffs of southern Utah, encompassing scenic vistas, geologic wonders, and a panorama of human history. Additionally, the controversy surrounding the construction of Glen Canyon Dam and the creation of Lake Powell contributed to the birth of the modern day environmental movement. The park offers opportunities for boating, fishing, swimming, backcountry hiking and four-wheel drive trips. Completion of the world's first transcontinental railroad was celebrated here where the Central Pacific and Union Pacific Railroads met on May 10, 1869. Golden Spike was designated as a national historic site in nonfederal ownership on April 2, 1957, and authorized for federal ownership and administration by an act of Congress on July 30, 1965. Rainbow Bridge is the world's largest natural bridge. The span has undoubtedly inspired people throughout time--from the neighboring American Indian tribes who consider Rainbow Bridge sacred, to the 300,000 people from around the world who visit it each year. Please visit Rainbow Bridge in a spirit that honors and respects the cultures to whom it is sacred. 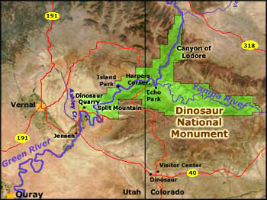 While Rainbow Bridge is a separate unit of the National Park Service, it is proximate to and administered by Glen Canyon National Recreation Area. Timpanogos Cave National Monument sits high in the Wasatch Mountains. The cave system consists of three spectacularly decorated caverns. Each cavern has unique colors and formations. Helictites and anthodites are just a few of the many dazzling formations to be found in the many chambers. As visitors climb to the cave entrance, on a hike gaining over 1,000 feet in elevation, they are offered incredible views of American Fork Canyon. 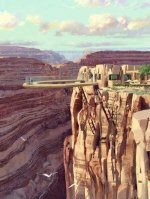 The Skywalk, managed by the Hualapai Tribe and located on tribal lands, consists of a horseshoe shaped steel frame with glass floor. The walkway juts 70 feet out from the rim, offering paying visitors the opportunity to safely peer 4,000 feet down to the bottom of the Canyon. The skywalk is part of a larger attraction called Grand Canyon West, which features an Indian village and "western-themed town." 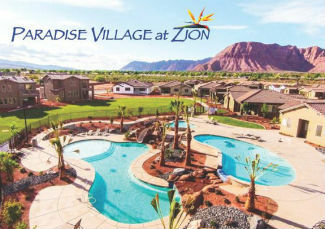 Introducing this vacation home resort community, the Paradise Village at Zion! Managed and operated by Utah's Best Vacation Rentals. Featuring over 90 vacation homes, custom clubhouse with an incredible two-tier resort pool with waterfall, waterslide, shamu kiddie pool, and hot tub/spa. This vacation home village is a first-of-its-kind master-planned vacation home resort specifically designed and built with traveling groups and families of all sizes in mind. Two homes per month are being completed at the Village, along with pool area, and all community amenities. The pool is now open and is a must see! Enjoy a fun weekend in southern Utah at our new Paradise Village in Santa Clara. Golf, visit Zion National Park, Snow Canyon, Bryce Canyon, or St. George. We now have 5 newly completed 3 bedroom homes available (each sleep 10).